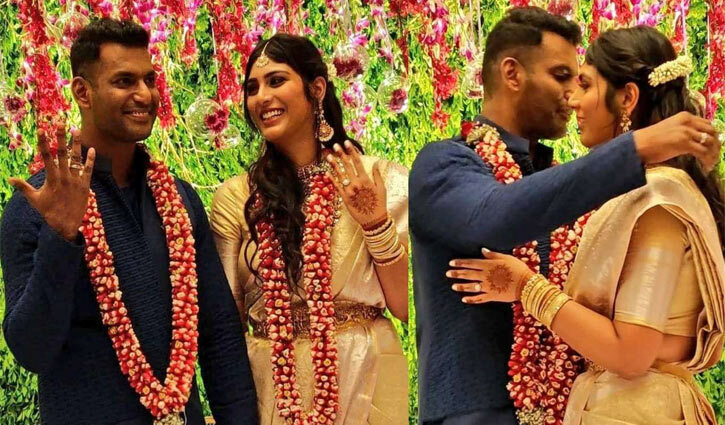 Entertainment Desk: Two months after announcing their relationship, South Indian actors Vishal and Anisha Alla got engaged on Saturday. The engagement was a private event held in Hyderabad. Vishal was seen wearing a Blue Indo-western kurta with a matching Nehru jacket while Anisha looked regal in an off-white silk saree with a golden border. Among the stars who attended the wedding included Malayalam superstar Mohanlal. Vishal is the President of Tamil Films Producers Council and Secretary of Nadigar Sangam. Anisha Alla is the daughter of Hyderabad-based businessman Dinesh Reddy. She has also acted in a couple of Telugu films like Pelli Choopulu and Arjun Reddy. Last year, when picture of a different person was circulated as Vishal's fiancée, the actor had to clarify that he was dating Anisha. The wedding date is yet to be announced. Vishal is currently filming for his upcoming film with Venkat Mohan - Ayogya. The film also stars Raashi Khanna. Sam CS has been roped to compose its music while the cinematography is being handled by VI Karthik and editing by Ruben. Ayogya is the Telugu remake of Temper, starring Jr NTR and Kajal Agarwal. The film was also made in Hindi (Simmba) starring Ranveer Singh and Sara Ali Khan.